Mechanoelectrochemistry, with main focus of solving the electrochemical, mechanical and thermal failures in energy conversion and storage devices, is emerging as a new discipline based on the principles of electrochemistry and mechanics of materials. Pioneering research has demonstrated that scanning electrochemical microscopy (SECM) and scanning ion conductance microscopy (SICM) with Shear-force Sensing technique were highly effective metrics and methods to precisely quantify nanostructured morphology-dependent charge storage function and coupled volumetric mechanical strain simultaneously in situ for polymer membranes that were fabricated using phospholipid vesicles as soft-templates. Such a Surface-tracked SECM imaging and sensing techniques provide a unique breakthrough in the formation of profound rules to design nanostructured polymer-based actuators, energy storage devices and biological sensors. Image by courtesy of Prof. Dr. Vishnu Baba Sundaresan, Department of Mechanical and Aerospace Engineering, Ohio State University, USA. In living systems, free radicals and reactive oxygen / nitrogen species (ROS/RNS) play important roles, because they can cause oxidative damage and tissue dysfunction and serve as molecular signals activating stress responses that are beneficial to the organism. 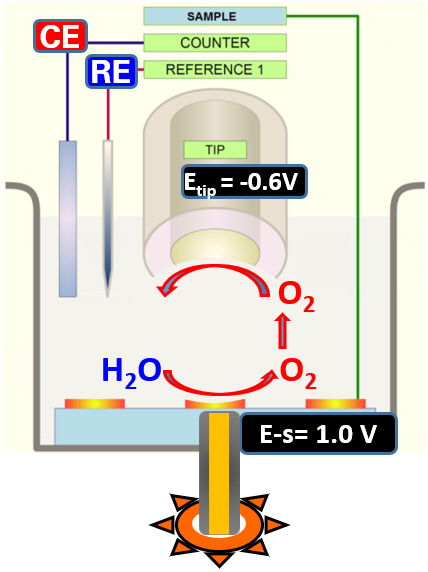 Scanning electrochemical microscopy (SECM) and spatially-resolved electrochemical methods were effectively applied to image and quantify extracellular local concentrations of ROS and RNS, as well as other redox active signaling molecules. Stable long-term (>3 h) quantification measurements with high temporal (>1 Hz) and spatial (<1 µm) resolutions have been achieved from individual live cell in the ROS production and degradation processes. Image by courtesy of Prof. Dr. Markus Hoth, Department of Biophysics, Saarland University, Germany. 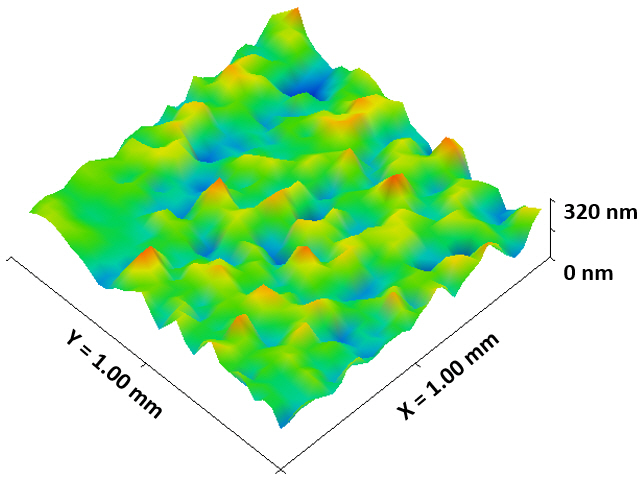 Measuring Nano-Scale Topography of Structured Surface with "Scanning Ion Conductance Microscopy"
Among the very few methods of imaging live cells at nano-scale resolution, scanning probe microscopy (SPM) is one valid approach to this cutting-edge challenge. 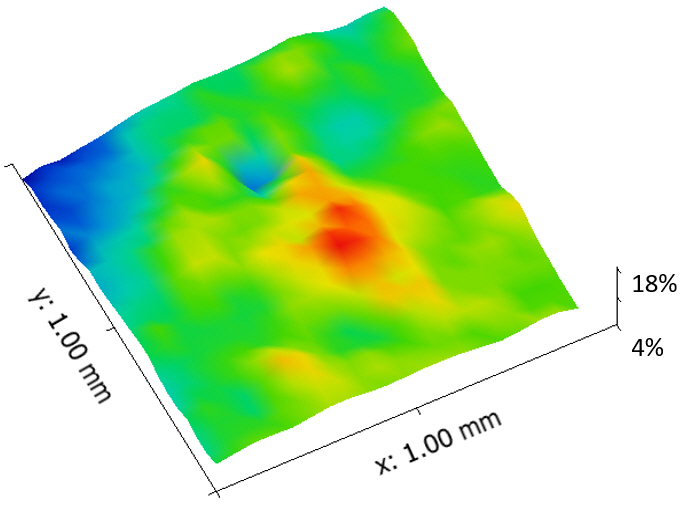 A major problem for live cell imaging by atomic force microscopy (AFM), particularly eukaryotic cells, is caused by deformation of the soft and responsive cell upon its physical contact with the AFM cantilever and tip. 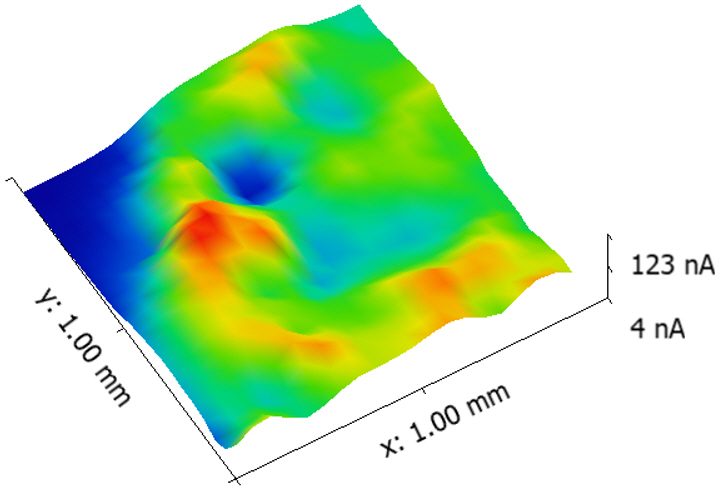 In contrast, scanning ion conductance microscopy (SICM) is another form of SPM technique that employs a simple glass nanopipette tip to image cellular surfaces under physiological conditions without physical contact and with a resolution of greater than 100 nm. SICM have been successfully applied to image even the most convoluted surface structures at the nanoscale, and it can be combined seamlessly with state-of-the-art super resolution fluorescence microscopy. Image by courtesy of Prof. Dr. L. F. Santana, Physiology and Membrane Biology Department, UC Davis, USA. Measuring In Situ Microscopic Activities of Photocatalysts by "Scanning Photoelectrochemical Microscopy"
Photoelectrochemical (PEC) processes have been studied for decades by a variety of research techniques, mostly in situ spectroscopy and ex situ electron microscopy. 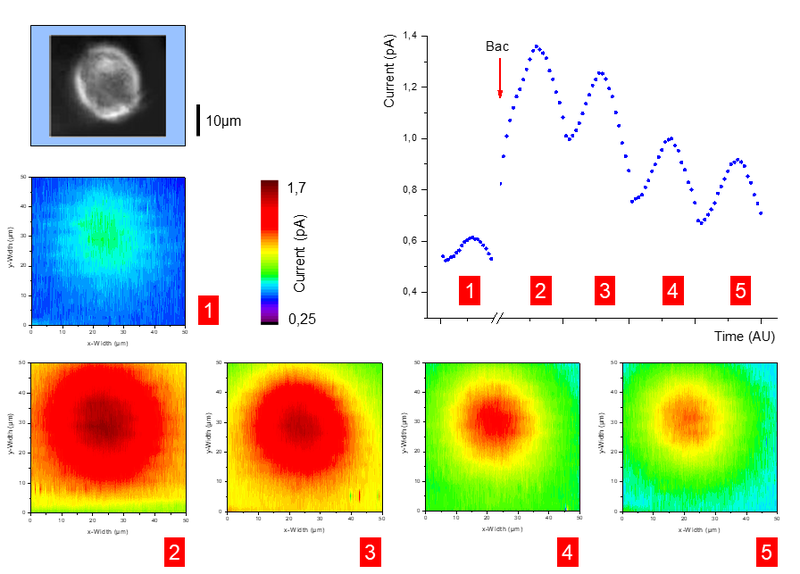 A new generation of scanning photoelectrochemical microscopy (SPECM) has recently been designed and launched to meet the needs of in situ microscopic analysis and imaging of photo-electrocatalytic reactions for photo-active materials and photovoltaic devices. Such a unique SPECM features a synchronized photo-excitation system seamlessly integrated with a scanning electrochemical microscope (SECM) system. 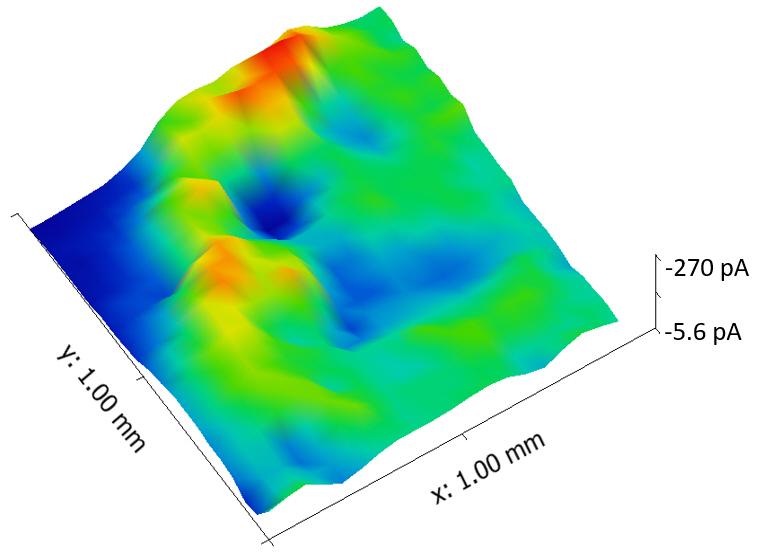 It can be used to achieve spatially-resolved mapping of steady-state photocurrent and local topography, as well as in situ imaging of redox-active PEC processes, such as catalytic reduction of CO2, catalytic productions of oxygen and hydrogen fuels from solar-driven water-splitting reactions. All these simultaneously obtained microscopy data can serve as a universal and cost-effective approach for benchmarking and screening photocatalysts activities. Within the Smart Ephys family, HEKA Elektronik GmbH is the expert for Scanning Probe Microscopy. Please either contact us or visit the HEKA website for more details.